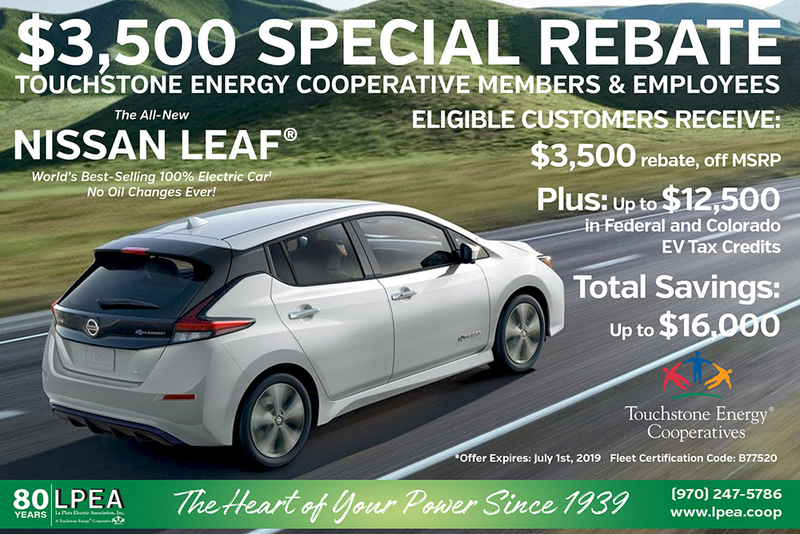 Electric Vehicles (EVs) | La Plata Electric Association, Inc.
LPEA members can receive a $3,500 special rebate on the purchase of a new Nissan Leaf using Touchstone Energy’s Fleet Certification Code: B77520. This offer can be combined with the $7,500 Federal EV and $5,000 Colorado EV Tax Credit to provide you with savings up to $16,000 on your purchase of a new Nissan Leaf. Now that’s the power of your cooperative membership! For rebate information contact Dominic May (970) 382-7770 or Nancy Andrews (970) 382-7775. The electric vehicle market is evolving and maturing. Although the concept of electrically powered vehicles was pioneered over a century ago, only recently have they become a viable vehicle choice for most Americans. Since the launch of the Chevrolet Volt and Nissan LEAF in 2010, growth of the electric vehicle (EV) market has been exponential, with more than 215,600 EVs added to American roadways. Although EVs still represent just a sliver (0.38 percent) of the total cars in the U.S., driver attitudes towards electric vehicles are changing. A recent Consumer Reports study found that 60 percent of Americans would consider a EV when making their next vehicle purchase. Electric vehicles are designed to either supplement an internal combustion engine (ICE) or eliminate the need for an ICE altogether. Electric vehicle system components generally include a battery for energy storage, an electric motor for propulsion, mechanical transmission, and a power control system. There are three primary types of electrically powered vehicles that plug into the grid (also known as plug-in electric vehicles, PEVs): plugin hybrid, extended range, and all-electric. A plug-in hybrid electric vehicle is a dual-fuel car; both the electric motor and the internal combustion engine can propel the car. It has a battery pack that is charged directly from the power grid. This battery-motor combination usually supplements an internal combustion engine smaller than those used in conventional or hybrid vehicles. The batteries in PHEVs can also be charged with regenerative braking in addition to plugging into the grid. Most plug-in hybrids run on electric power only up to about 40 mph, at which point the internal combustion engine and electric motor work in combination. Toyota began selling a plug-in hybrid for the U.S. market in February 2012, although kits to convert cars to plug-in hybrids were available before that. Plug-in hybrids with a built-in range extender unit are also known as extended-range electric vehicles (EREV). For most EREVs, like the Chevrolet Volt, an internal combustion engine serves as a range extender by powering an electric generator that, in turn, charges the battery. The Volt has an electric only range of about 40 miles. All-electric vehicles have no internal combustion engine and must be plugged into the electric power grid for all recharging. To accommodate a range of 80-plus miles per charge, electric only vehicles require larger batteries than the combined electric-petroleum cars. Nissan began U.S. sales of its 100 percent battery electric vehicle, the LEAF, in late 2010. Americans spend significant portions of their lives in cars. According to the U.S. Census Bureau’s American Community Survey, Americans, on average, spend 100 hours a year commuting to and from work. For many, cars become like a second home. Because Americans spend so much time in cars, vehicle purchasing decisions are often influenced by nontechnical factors—such as the number of cup holders, the look of the car, storage space, a sun roof option, and media accessories. In 2011, major car manufacturers offered just three EV passenger vehicle models, all compact hatchbacks. By mid-2014, 19 EV models were available. In 2014 alone, four car makers — Audi, BMW, Cadillac, and Honda — entered the EV market for the first time. Based on product announcements from car makers, it is expected that there will be 22 different EV models from 14 different automotive brands by early 2019. However, it is important to consider each model’s market position and production volume. Some models on today’s market are “compliance cars”—all-electric vehicles produced at low volumes and primarily manufactured to meet California’s zero-emission vehicle (ZEV) regulations. A primary benefit of PEVs is that a driver’s trips to the gas station are either vastly reduced or eliminated altogether. However, in lieu of gas refueling, EVs need to be recharged by plugging into the electric grid. Electric vehicle supply equipment (EVSE) is the technical term for a EV charging station. EVSE ensures that a safe and appropriate amount of electrical energy is delivered to the EV from an electricity source. EVSE is classified by the general rate at which the batteries are charged. Charging times vary based on how depleted the battery is, how much energy it holds, the type of battery, and the type of charging station. Alternating Current Level 1 EVSE (often referred to simply as Level 1) provides charging through a 120-Volt AC plug, the type typically used in American homes. A Level 1 cord set is almost always included when buying an EV. On one end of the cord is a standard, three-prong household plug. On the other end is a J1772 standard connector which plugs into the vehicle. Charging time: Level 1 charging typically provides 2–5 miles of range per hour of charging. AC Level 2 supplies charging via 240-V electrical service, approximately the same power supplied to an electric dryer or oven. The most basic AC Level 2 products have standard safety features and status lights. More advanced, “smart” Level 2 products have features such as enhanced displays, charging timers, communications capabilities, and keypads. Level 2 equipment can be used at different charging rates, from 3.3 kW up to 19.2 kW. Charging time: Level 2 charging typically provides 10–20 miles of range per hour of charging. Direct current (DC) fast-charging equipment typically provides a 208-V or 480-V three-phase input and enables rapid charging. DC chargers are typically found at public charging stations in high-density areas and along highway traffic corridors to enable longer distance travel with an EV. DC Level charging stations can cost between $50,000 and $100,000 to construct and have power requirements that exceed that of a typical American home. Charging time: DC charging typically provides 60–80 miles of range to a light-duty EV in 20 minutes. The components that comprise EVSE vary slightly depending on the classification of the EVSE, but generally include a cord, connector, coupler, and inlet. LPEA has four ChargePoint Level 2 charging stations at our Durango headquarters providing FREE EV charging! Stop by and plug-in anytime. 45 Stewart Street, Durango, CO 81302.